The weird and wonderful world of the new Arsenal continues to entertain us. We invite the opposition to have a go but our philosophy is to simply outscore them by the end of the game. You score four but we score five and we get the three points is Emery’s philosophy, it seems. Do I like it?! Pfffff, a win is a win but surely we cannot continue like this for the rest of the season? Who needs a midfield, hey?! It remains a mystery why Emery is not starting with the multi-disciplined Torreira but choses to put him on late to steady the ship. I really don’t get the inclusion of Guendouzi in the DM pivot. By all means play him in the hole instead of Rambo, but next to Xhaka does not work for either of them. It does not look that Emery will change the deeper midfield players anytime soon, and as long as that is the case we will be playing with a weak midriff imo. It will weaken the defence but strengthen our attack, and we may well win a lot more games with a small margin and lots of goals conceded by either team. Torreira’s late substitutions into the team might well be Emery’s special joker… but I would start him next to Xhaka in each and every game. Lacameyang, Aubacazette, or just Auba-Laca: what a combination of attacking skills! They are dancing their way to the goal and the more they play together the better they can get. Against Cardiff City they each scored a fabulous goal. Auba’s effort was Henryesque, something only athletic footballers can do. Laca’s effort was, dare I say it, Van Persie-like: such venom and precision in that postage-stamp howitzer. They both were works of art and those are the sort of goals fans come to stadiums for. Let’s hope they play together in most of our games this season. Ozil, Mkhi, Rambo: three is a crowd. We cannot play with them all on the pitch, or can we? As Rambo has not signed the thing, I would opt for benching him. Ozil signed a new deal and is clearly a cut above, Mkhi joined us to finish his career at the home of football…. and Rambo just keeps us hanging on. And I whisper it, but he is actually not that good (anymore). So pick your two but I would start with Mkhi and Ozil in most games, and I would use Guendouzi to replace either of them after sixty minutes or so. Emery keeps picking the triangle of Cech-Sokratis-Mustafi but is that really the strongest combination he can go for? Early days, I know, but IF he wants to play out from the back, which he clearly does, he has to pick the players who fit that system best, no? For me it is Leno-Sokratis-Holding. An easy with theball keeper, a calm (and tall) head of Holding and the wisdom of the philosopher. But who are your best picks at the centre-back for you? Anyway, enough from me. What are your international break Arsenal – or any other – musings? TA, …. nice post for the lull. It a call for us to gather and strategize with Emery on the way forward. How I wish it is majority carries the vote. Give me a 1-0 win. I don’t care for the 5-4 torment. Torreira excites me too. He is like 90% of Santi with the ball plus 90% of Le Coq without the ball. That’s a dream. I don’t, anymore, want him confined in that small space in front of the CD. His portfolio has grown much larger and he would be our undisputed metronome. Ozil who loves intelligent players would love him not too far away from him. Torreira 1st name in the MF. And TA …. what about Aulac. Emery has to find a way to bring them into closer proximity. Possibly take the “c” off and make it Aula-la-la! Who wouldn’t fear us when those two are a simple pass apart. Ozil, Mkhi, Ramsey. I accept two is company. It boils down to Ozil or Ramsey : vision or energy.The eye of the storm is a quiet place full of intelligence. That’s the point Emery has to find for Ozil. And Ozil has given him the clue when he drifted centre and deeper 2nd half against Cardiff. Things started happening. You see, Ozil is a passer. If he has a 60% chance of scoring a goal, he’d still spend a split second to check if there is a mate better placed so he can pass to him. He needs players in front of him that’s why the eye of the storm is from deeper. So Ozil and Mkhi it is but for purposes of the dressing room Ramsey, Iwobi, and Welbeck are thrown into the equation and some rotation is born. At our rear Emery has instituted a kamikaze triangle. Not at all good for any heart not to talk of the weak ones. Just this one point I don’t agree with you TA, the philosopher doesn’t seem to be a ball player so for me ithe choicest is Leno—-Musti—–Holding. I actually like the mini crowd of Mkhitaryan, Ramsey and Ozil. For years I’ve complained about a lack of Rotation by Arsene. All 3 of these guys have different strengths, so substitution and starting vs certain opponents gives Emery options. I always wanted Ozil taken off early, as Mourinho did, and got the best out of him. I always complained about Wenger running Ramsey’s hamstrings into the ground, as occurred almost every season. And Mkhitaryan isn’t so young anymore. I don’t really get why you aren’t seeing the Guendouzi positives that most of us see. His stats back us up in that he’s playing very well. I like him deeper because he has a nice long passing game, but even more, can run with the ball which draws defenders out of position, losing their shape, and opening up more options. He has done that more than anybody else in the team, by far. Of course I’d like to see much more Torreira, and agree with Pony on the comparisons. I said the same after watching his YouTube compilations. He can be our new Santi, with some Coquelin mixed in. Watch his pre-Arsenal vids, you will see why 30 mil was a steal. I’d go with Leno personally, but admire Cech so much for not letting his ball playing embarrassments lead to other keeping errors, from losing confidence. A true professional. Sokratis must do better as far as putting him in tough spots. Attack is Mikhiterian, Lacazzete Auba. Can I just clarify we are talking about the same Aaron Ramsey? Would that be the guy who despite nearly having his leg amputated playing for the mighty reds? Scored winning goals in two cup final? Was the fans player of the year last season. Created 4 chances ( more than anyone else else.) against Cardiff? And unless I am greatly mistaken, never misses away games because he is a little off colour? Benelux 10 out of 10 …. ah wait a minute no Mutafi? Count me out of that. Count Emery and Wenger out of it too. Also count the stats out of it, WhoScored, Squawka PPS and others. Roles have been redifined in football. A striker is a defender when the opposition has the ball and a defender is an attacker when he has the ball. The value of a player is his 360 degrees worth. Our last match if you saw nothing am sure you saw the bullet header. It’s consistent. And note the defensive stats (not the more subjective ratings but the defensive actions) have him ahead of all his mates. So no way for yet to be tested Mavro for me. Retsub …… you are ever so well balanced 🙏🙏🙏. I’d never use an unappreciative word for Ramsey. Only in my context I see it as Ozil or Ramsey like I see it as Xhaka or Guendouzi, Leno or Cech. With this either or, for me (I wouldn’t even swear on this) it’s Ozil over Ramsey. Luckily the inevitable rotation makes any choice easier to accept. Pony is right about Mustafi. I haven’t seen the defensive actions stats, but I see him as a very active defender every week. Such a hard worker, though not the greatest at anticipation. Lots of blocks and clearances, and a great athlete who sacrifices his body. Also, a very good passer for a defender, and when our midfield stalls a bit, comes further out, making opponents move toward him, freeing up others. On Ramsey, I’m with retsub. He’s been a little off on his timing offside, but he still makes scoring runs that few midfielders in England can. He will get hot and score in bunches. I don’t get on his case about too many runs into the box because he works really hard all around the pitch. We will miss him a lot if he leaves, especially if he stays in England. J, I don’t get the benefit of taking Ozil off after 60-70 minutes. The Moaning Sod did it because he liked to play it safe defensively towards the end of the game. I am worried that Ozil is suffering from all the negative attention in recent months and Emery’s plans with the team. If Ozil is cooking with gas the team will be doing so too, especially with LacaMeyang to appreciate his peerless attacking balls. Agreed on the praise for Cech – he is a man in full. Benlux, good shout for Mavropanos. Looking forward to seeing him in the UEFA games. I have defended Rambo over the years and he is not a bad player but he is not that good either. When he peaks he is good, at times very good, but his peaks are infrequent and don’t last long enough. Nothing against him but I reckon we need to let him go to move forward. Had he signed this summer I would feel slightly different about it…. but he didn’t. Time to cash in this January, if somebody actually wants him (and he wants them, which is the hardest part…). Mustafi is also part of my plans, even though some of his positioning and anticipating is very poor. I wonder whether Sokratis and Mustafi are too similar in style and I do like the calm Sokratis brings to the proceedings. I reckon Sokratis with Holding (and Leno) would be strong, but I also like to see more of Mavropanos and Mustafi together. You know I am going to disagree T A . Personally I think Rambo is our best player. I have gone out of my way not to critisise other players this season. But feel the need to defend him. If he does re-sign and I really hope he does I have little doubt he will score and provide more assists than any other midfielder. If he moves and stays in England he will come back and bite us. I guess we are going to agree to disagree again. Good post and some equally good points. For me, the biggest disappointment so far this season, other than our defending, is the injury to Ainsley Maitland-Niles, he has been gradually building up over last couple of years and was primed to have a great season, but thanks to a regulation foul by a dirty Man City player he’s in rehab. I would have loved to see what Emery could have done with AMN over the last three league games and how his inclusion might have affected the line ups/substitutions etc. I agree with those on here who opine that Ramsey will leave, to me it’s as clear as the nose on the end of your boat race, I actually think he lost some connection to our club when Wenger left, maybe a bit like Koscielny? I’d play Leno after the Interlull, but I don’t see Emery doing that yet and I would have started Lacazette from the off, so I’m pleased to see him in the team again, it would be daft imo, not to fully utilise two £50m strikers. But if Emery in the future, wants to play one striker then I think that Lacazette is more suited to that role. It’ll be interesting, if either Mustafi or Sokratis get injured or suspended, to see who Emery will turn to as first pick cover, Mavropanos or Holding? I like them both and hope they get used in all the forthcoming League Cup and UEFA Cup matches, with the possible exception of Sporting (a) as that’s going to be a monumentally difficult game. Kev I truly hope your Conk is wrong this fine ( I don’t think there is rhyming slang for your nose). . If Rambo goes I will need a new favourite and I am struggling. Aubameyang May be a candidate. I do like a guy who smiles and my spell checker has already adopted him. Sorry mate, I just don’t think he’s as committed as he was, you know, it’s not as if he’s busting a gut to prove he deserves a large increase on the clubs final offer. I just get the feeling that the club have drawn a line in the sand and won’t go over it, whilst Ramsey’s agent has, I think, overplayed his hand, I mean didn’t Jack take a pay cut to join West Ham, so it wouldn’t surprise me if Ramsey didn’t do likewise? 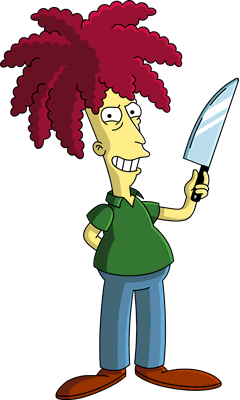 I may go for Guendouzi , although Sideshow Bob is easier to say. I think Torriera could br fantastic, just what we needed. Plus his home town is Fray Bentos and I do like a steak and kidney pie. Can’t beat a nice plate of bully beef with potatoes, carrots and pickles Retsub.. Sideshow Bob! Named Arsenal’s Player of the Month. Voted for by 68% of fans participating. In this transitional season? I see little harm in ‘finding out if Bob is for real’. He might continue on the upward trajectory– or level-off as did Holding and Kolasinac. Neither of which will occur if he isn’t starting games. This season– is one to step out onto the ledge and take a seat. Dangle your feet. Live dangerously. Because if– the team is to a big leap forward– it must be willing to take risks. If Sideshow Bob is thought a risk? So, things are gonna evolve (or maybe devolve or let’s just say “change,” I think) BUT, if we’re looking at the first four (league) games and trying to decipher things, here are (some) of my thoughts. From those games and the last one (Cardiff) in particular, I’ve gotta agree about a dysfunctional MF–or maybe that, under Emery, we need to realize that “midfield” as we knew it under Wenger, is a thing of the past, the two dedicated deep-lying guys are almost part of a back 5 with the CBs and the keeper (more on this below). There’s some suggestion that we moved to more of a 4-3-3 in the 2nd half in Wales (and a more traditional idea of a midfield) to positive effect, with things getting even better once little Torriera came on. Playing this way essentially kills our wide game but allows some separation between Ozil (deeper and more central and part of the MF three) and Ramsey (one of the three up front). I’ve gone on and on about this in the past, but I see Rambo as a space hog and Ozil as a space maker (but also a guy who will defer to the glory seekers), so, if you’re gonna play them together, this (to me) is a very good solution. Explaining further, as best as I can… Under Wenger, our FBs often helped our MF moving the ball out of the back creating 3 v 2 overloads out wide and/or tempting defenders to follow the ball and challenge for it on the touchline while possibly leaving spaces in the middle of the pitch open for our MFs to exploit. Under Emery it’s very different. Now, it’s the CBs who are supposed to move wide and then get the ball back central (with significantly longer passes…) to the two deep mids (or back to the keeper if they must) while the FBs race forward as targets for (much) longer passes. Lotsa pressure on the CBs and those DMs, but extra men forward if we can spring them with a longer/wider pass. Maybe this is why it’s been Xhaka (big left foot) and Guendo (big right one) starting the matches. Of course, mostly, “howlers” are the province of goalkeepers… and my feeling here is that Emery (and everybody else who cares about Arsenal) will have to pick his poison. No games played for Leno so no howlers for him yet. Hopefully he continues on from what (sounded like–I didn’t watch much of it…) was a good pre-season in these upcoming cup games. If he does, Cech may be in line for a “slight knock” (an “Emery-njury?…”)… Certainly the old guy with the headgear has had some VERY ugly moments but has made the saves he should have made (and a couple others too). He’s now let in a set-piece goal (the 2nd for Cardiff, failing to sufficiently organize his defenders, maybe…) but I have BIG worries about Leno in similar situations. To my eye, we’re just kinda tiny and even more frail looking than we were under Wenger. (Frankly, if you’re calling Holding “tall” I think you’re stretching the definition–I miss the BFG and Giroud–and I think it might be Mavro who is actually our tallest CB.) Finally, I feel the assessment of Mustafi is (just about) all wrong. IMO, he’s both our quickest and strongest jumper/playmaker AND our best passer. Mistakes are pinned upon him and I do believe he “sells out” (goes to ground or otherwise attacks the ball) too predictably–just as you’d expect a guy who has always been the most athletically talented defender on all his teams at every level. Sometimes he’d do better trying to limit the quality of an attackers touch (or herd him towards his teammates) rather than trying to stop it altogether. It’s tempting to throw him out (with the Wenger-water?…) but there’s a good player in there, if he can tame that feeling that every ball is (always) his. If he doesn’t improve in this regard, I’d blame the coaches, you know, like everybody always did (forever) while Wenger was at the helm. The resemblance is uncanny HT. If only for the ‘edginess’. Been meaning to also send a ‘fine post’ your way. –at the back is where we’re heading eventually. Themed with my perspective on trying things out? It might be time. This on the heels of possibly Mustafi’s best all-round performance since last Fall versus Spurs. These glimpses of brilliance are an opiate. Which wears off — to the gut-wrenching frustration of crises-level-defending most weeks. I’ve never stated Mustafi doesn’t have the physical tools required. Mustafi? Looked very good last week. We should all be pleased. Sokratis– used his guile to protect a possible loss of 4pts these last 2 matches. Without anybody singing his praises. As much as Petr is a fave of mine also? And give him props for not yet embarrassing himself (as much as others believe he’s done so). But we are playing (out) with one leg tied back to continue with Cech in goal– while playing this style. For example: Guardiola has a keeper who plays from the back with aplomb. Ederson is NOT a good shot-stopper IMO– but he makes that attack much slicker and more dangerous by a factor– than Bravo or Caballero (or Hart!) ever could. And Pep risks that less-than aspect– for the singular, superior quality Ederson offers his outfield players. Again IMO– it’s time for UE to allow Leno– to lend that ability to our already-dangerous attack. Did anyone see the Arsenal Greats v Real !Madrid Greats this afternoon? When people debate Cech or Leno there is now only one answer. Jens Lehmann, man of the match in goal. He then overruled Thomas Rosicky and scored the final penalty shootout. Roy of the Rovers stand aside. Just read about and watched highlights. Very entertaining! As Jens always is. Jw1. Certainly couldn’t complain about lack of entertainment. His distribution was pretty hot as well. 17ht, I will never underestimate the Europa League. Mainly because David can defeat Goliath. We must continue to have the OGAAT attitude, and win game by game. Retsub1, pity that the lack of highlights underwhelm the effort of Mad Jens. But all keepers have the same mad streak in them. Just ask Cech. njk I think Mad Jens was a little wilder than most keepers.. can you not access Arsenal player abroad? They showed all of yesterday’s match live and also provide live commentaries on most Arsenal games.